B's Beauty and Books: Surviving Raine ARC Review! I cannot begin to express how thrilled I was to be asked to read and review this novel! Thank you Shay Savage! There are spoilers in this review! You have been warned =)! The first thing I have to tell you is that I was surprised so many times during the reading of this novel. It is not a happy go lucky love story in the least. It is dark, gritty, scary, & totally captivating. I wasn't sure what to expect given I had not read anything by Shay Savage before. Although from what I have heard Otherwise Alone is apparently brilliant! So I will be picking that up next! 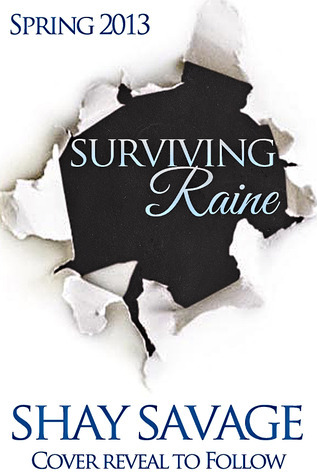 Surviving Raine surprised me right off the bat because it is told through Bastian's POV. We see a lot of sequels lately that show the male POV but not a feature novel. So this was a refreshing way to start a rather intense read. Bastian is a completely different character from anything I have read. He is the true anti-hero. There is a lot in his past that is so deeply disturbing, that on more than one occasion I had to put the kindle down and take a small break. There is murder, torture, suicide, abuse, womanizing and so on in his past. I don't want to give too much away, but he is someone you will find completely troubled. Raine is so unsure of herself given her father's unfortunate murder. A life of essentially having to look out for herself and not having anyone (other than her super close friend, Lindsay) look after her. We find out that she became emancipated, didn't finish high school, and is just now heading to college even though she is in her early 20's. By no means the charmed life that Bastian is under the impression she leads. She is vulnerable, yet strong and determined. Bastian is running a private pleasure cruise and is so distant with everyone. He is a alcoholic with very few good traits. He runs through prostitutes and cigarettes like no one I have ever seen. He makes no apologies for it, and even seems to celebrate it. He is beyond rough around the edges and you can just tell he is torturing himself and trying to forget what he left behind. When his ship capsizes he saves a unconscious Raine, and shows her how to survive. She puts up with everything from being yelled at, for no reason, to being punched by Bastian. There are a lot of reasons to hate him, but you find out that he is so scarred from his past, that he has little control over his temper. Although the addictions don't help. I wanted to hate him more than once, but I just couldn't. My heart felt for him. We see how they survive, how they fall in love, how they fight and how they move forward. A lot of self healing and a lot of forgiveness. You will see some of it coming, and other things will take you by surprise. But this is a couple you want to root for. A couple you want to see have a HEA, because they deserve it. There are so many more things I could go on about. There is a lot of story here. A well written, balanced, challenging story. I absolutely recommend this novel. I will warn you, there will be times you are frustrated and times you will need to just put it down for a minute, but remember, the best stories are the ones that make you FEEL something. And this made me feel everything! I give this 4 lipsticks!!!!! This ARC was kindly provided and happily received in exchange for an honest review.